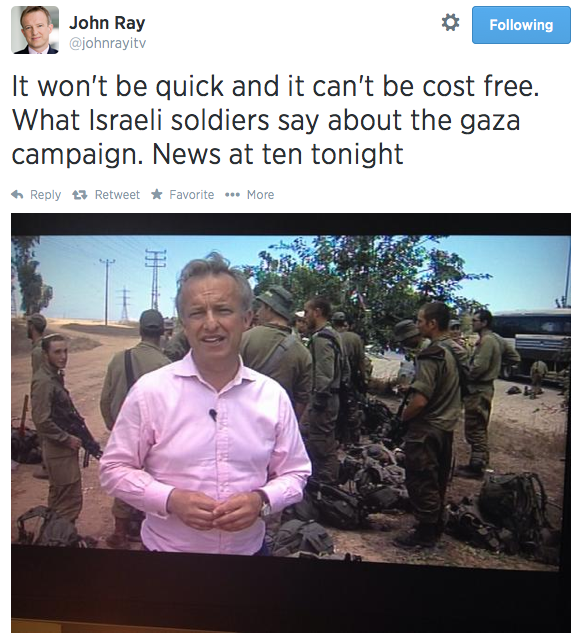 Despite optimistic claims that “Israel is losing the social media war over Gaza”, the mediating influence of the news industry remains dominant in our cognitive understanding of the conflict; contorting information through both bureaucratic and institutional parameters; determining what is sayable and unsayable, what is visible and what remains hidden. However, there is certainly a sense that this power is beginning to be eroded. Whereas television was said to bring war into our living rooms, social media realises the uncensored sights and sounds of war in realtime. Paul Mason’s recent essay on the role of social media in informing a new generation of hyper-connected news readers makes a strong case for a shift in power. Unfortunately, there’s little evidence this has translated into a broader media shift. According to Gallup US public opinion remains unchanged. A recent survey found that while there is disagreement over whether Israel’s actions are ‘justified’ or not, Hamas’ actions are overwhelming found to be ‘unjustified’. On a more general level, according to a March, 2013 survey, Gallup found “Americans’ Sympathies for Israel Match All-Time High”, with 64% of American’s identifying as “sympathetic to Israel”. As far as the UK goes, according to YouGov, sympathies for Palestinians have actually decreased steadily since 2010, while those for Israel have increased. And, of course, Israel is still bombing hospitals, schools, news bureaus and power stations in Gaza, while the international community continues to reaffirm it’s right to do so, without consequence. But Mason is right, new networks of communication have indeed formed, and they do, to some extent, side step the traditional channels of news distribution. At the same time, internal technological disruption is changing how news organisations mediate the space between what is experienced and what is reported. On some level it’s hard to believe the change in tenor of coverage of the latest assault on Gaza between now and previous assaults on Gaza. It seemed improbable only weeks ago that the voice of the victim, that is so audible in coverage of the Syrian conflict and before it in Libya, would appear in Gaza. It’s not clear to what degree Israel’s miscalculation in allowing journalists to experience first hand it’s bombing of Gaza (in contrast to 2008’s ‘Operation Cast Lead’ where foreign journalists were restricted from entering Gaza) is responsible for this shift in tone, or whether the shift would have occurred if we were completely reliant on Palestinians to tell their own story. Certainly those journalists reporting primarily from Tel Aviv appear to continue to reflect the tone of previous conflicts, with equal focus on Hamas’ ineffective rockets and Israel’s ‘precision’ strikes. For the social media reader, the shift is undeniable. Journalists across the major Western networks are expressing the emotional anguish of the victim over that of the aggressor. All the more surprising in a conflict where one side receives billions in military aid from the West and the other is predominantly inhabited by people who have been demonised in news and popular fiction for decades. Which makes you wonder what kind of a narrative we would have heard from Iraq if it had been invaded a decade later? But it would be naive to declare that this social shift is reflected in reporting on the whole. The gulf between the tweet and the nightly news report is, for the most part, clearly visible. At the BBC, ‘peace’ continues to be intensely pursued by the international community, even while it is supplying weapons and official rhetoric that can only prolong violence or encourage escalation. 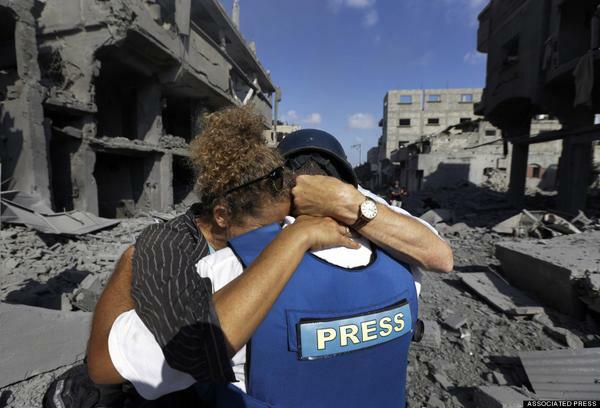 Social media has also broken the professional taboo of expressing human emotion in reporting. 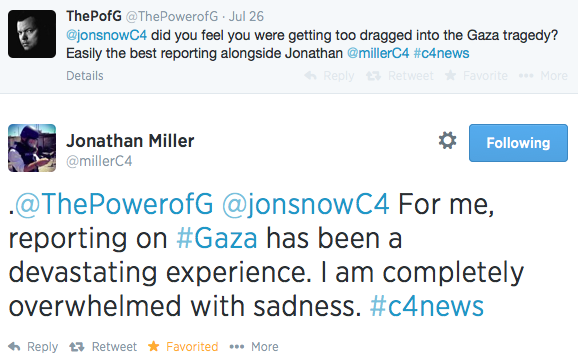 Channel 4’s Jonathan Miller gave his followers an insight into his experience of the conflict, that we would, in previous decades, have had to wait for his memoirs to read. On his return from Gaza, Miller’s colleague, Jon Snow, recorded an earnest call for action to end the killing he witnessed first hand. Like Syria and Libya before it, journalists are not only experiencing conflict first hand (the Guardian’s Peter Beaumont even delivered first aid to victims of bombings), they are enabling us to live it through them. And, in contrast to Iraq and Afghanistan, they are shunning (with notable exceptions) the embed culture that twisted so much of the reporting during those wars. But have we really seen a sea change in reporting arising from this social shift? Which seems prescient in retrospect, given that later NBC would withdraw (and, following much criticism, reinstate) a reporter “who personally witnessed [the] killing”. Broadly speaking though, the evidence is sparse. Implicit in this is Israel’s right to attack Gaza – the question is whether they will concede to learn from these controversial ‘engagements’. Elsewhere, state broadcaster RTE happily defended itself of stripping video and audio of context, depicting victims as violent, and all the while declaring that it “did not misinterpret or misrepresent”. NBC is of course the same network who’s host David Gregory urged UN Relief & Works Agency spokesperson, Chris Gunness to comment on an IDF supplied video he had not seen, which purported to show Hamas firing rockets from a UN school, and which later turned out to be fake. So in the face of these unmediated social accounts there remains constructed frames which determine how we collate and understand these images and words. These frameworks ensure that despite what is witnessed, what is captured in tweets and photos, the conflict and how we respond to it remain understood in terms of greater narratives. Concepts such as “Iron Dome” and, despite it’s well meaning intentions, “[Gaza’s] open prison” feed into the picture of Israel as a country under attack. Arising logically from the idea of defense is the concept of “response”. How should Israel respond to this threat? And from that the question comes the next, what is a “proportionate” response? 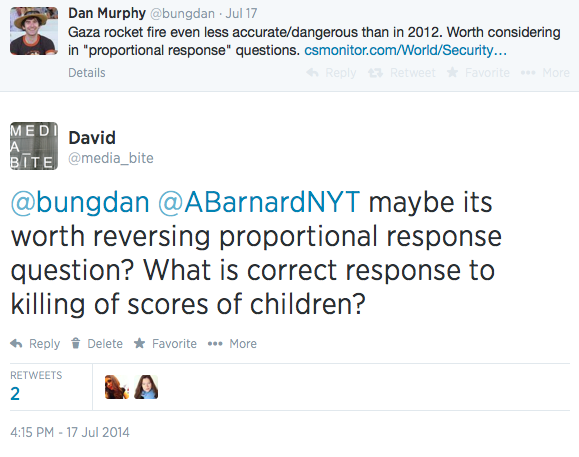 These are the principle questions our press concerns itself with, even when faced with hundreds of dead children. It’s almost unheard of to read in the press any discussion of how Palestinians should respond to Israeli aggression, and whether that response could be other than peaceful acquiescence. It is part of the unsayable. Palestine has no right to armed resistance*, unlike Syria’s rebels, who continue to receive Western support (whether directly or through proxies) and remain entrenched in a protracted civil war. Or Benghazi’s rebels, who with air support from NATO, uprooted an oppressive state in a bloody but brief conflict, only to continue battling for power years later. 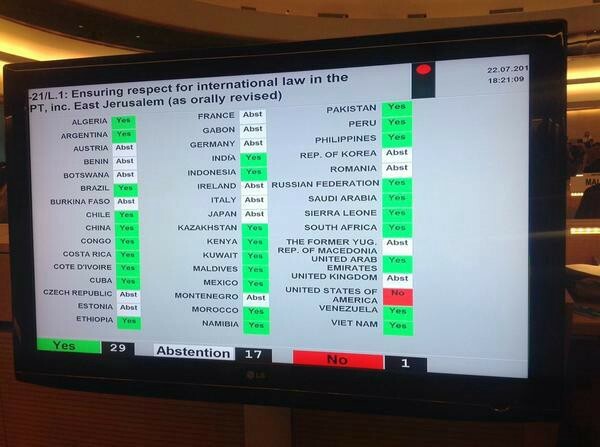 Equally, there is no question of how the ‘international community’ should respond to Israeli aggression. There are no intense EU debates about possible sanctions to curb violence or restrict the supply of arms. These too are unsayable. Until these broader narratives are tackled Israel will continue to win the media war, and it remains more likely it will continue to be free to pursue it’s military ambitions.